While homeschooling has a great number of benefits, every homeschooling family will face challenges along the way. That’s why Calvert offers FREE support and advice from our experienced Education Counselors. Available by phone, email, or online chat, Calvert’s Education Counselors are available to help you with educational questions and to offer practical homeschooling advice, tips, and support. Here are some of the most common homeschooling challenges and some tips to help you through the rough patches. Over-Scheduling – Many homeschoolers find that it’s easy to get involved in a lot of activities in their areas. Field trips, homeschool co-ops, dance classes, martial arts, piano lessons, swim lessons, homeschool sports teams…the list goes on. While it’s wonderful to make time to participate in these activities and form connections with other homeschooling families, be sure to keep your priorities in check. Over-scheduling and over-commitment can make for tired children and burnt out parents. Be sure to leave room in your schedule for academics and down time. Parent vs. 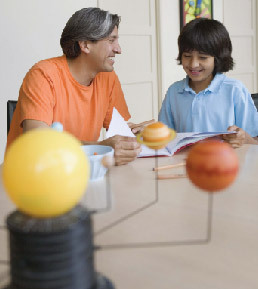 Teacher – One of the most common homeschooling challenges deals with a change in the role from parent to teacher. While Mom can be playful, cuddly, and fun; TeacherMom needs to ensure the children are paying attention and following through with their schoolwork. This is a delicate balance that many families find challenging and behavior issues can be common. One of our Calvert Moms told us she has a special “teacher’s hat” that she wears when she’s acting as the teacher. When she’s wearing the hat, her children know that she’s in “teacher mode” and it’s time to follow the homeschooling rules and expectations. Be sure to set clear rules and expectations for learning time and follow through with behavior consequences. Juggling – As a homeschooling parent, you will have many balls in the air at the same time. There will be days when you just can’t stand to see the dirt marks on the kitchen floor, you have nothing in the fridge for dinner, and the entire family is out of clean underwear. Most often, these realizations will happen when you’re in the middle of teaching a science or math lesson. Don’t let it get you down. Many homeschooling families incorporate chores into their homeschooling day. Older children can vacuum, mop, and do laundry. Younger children can help sort laundry, feed and water pets, and help load the dishwasher. The entire family can help with meal planning, shopping, meal prep, and clean up. Learn to delegate. Make chores and meal planning part of your homeschooling routine. Younger Siblings – Many of our Calvert families have babies and toddlers at home. This can present challenges when the younger children need care and attention while the parent is teaching a lesson or working with an older student. Many of our Calvert families schedule some of the more difficult subject areas during nap time. This can help ensure your older student receives individualized attention with their more challenging subjects. Another helpful strategy is to create “busy boxes” and offer younger children educational activities to keep them entertained. Also be sure to involve the younger children in hands-on activities, craft projects, and science experiments (as age appropriate). It’s easy to modify some of the activities and allow your younger children to participate. You’ll be surprised at how much they learn! One Calvert mom told us she was shocked when her 3.5 year old son started telling a relative about the process of Photosynthesis! While the child was playing, he was also absorbing a great deal of information from his older brother’s lessons. Create educational activities to help entertain younger siblings and be sure to include them in hands-on activities for older students. Dealing with Doubters – Unfortunately, many homeschooling parents face challenges with relatives, friends, and even strangers who are not supportive of homeschooling. Whether you’re dealing with grandma, Uncle Joe, or the cashier at the grocery store, be sure to keep your cool. Explain that you’ve made a decision to homeschool your children because it’s what is best for them. Over time, many friends and family members will come to realize that the children are thriving in the homeschool environment and some will even become homeschool supporters! Fears about the legitimacy of learning at home can be calmed by explaining your choice of an accredited curriculum or using an additional, objective grading service like the Advisory Teaching Service to help measure learning and keep records and transcripts for the future. Keep your confidence and don’t let the doubters get you down! Learn how Calvert supports your homeschooling success. While homeschooling can be challenging at times, the folks at Calvert will be with you every step of the way. Our Education Counselors are available to all enrolled families for free consultations to help you with alternative teaching strategies, to answer specific curriculum questions, to offer practical advice on how to help students stay focused, and to help you customize lessons and curriculum that best meet your child’s needs. 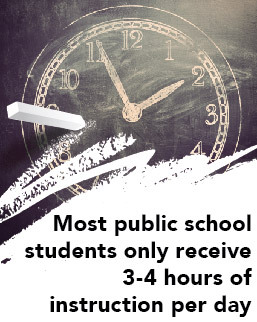 Now is the best time to make the switch to homeschooling! ENROLL NOW and make this a great school year. Call 866-816-7157 to speak with an Enrollment Advisor.